I finally got around to deploying a prototype OWHL unit in the real live ocean to log some waves. The low-tech housing is made of 1.5″ schedule 40 pvc pipe. 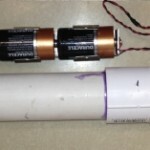 The pipe snugly fits the D-cell battery holder, while the electronics fit inside the modified 1.5″ end cap.